The National Hydrocarbons Agency (ANH) spoke about the GUA OFF-1 and COL-4 projects; two Offshore discoveries that will boost the national industry. While the country debates about the future of fracking, engineer Germán Espinosa, President of the Chamber of Petroleum Goods and Services (Campetrol), spoke about the potential of conventional fields. The government has gone back and forth when it comes to the development of fracking in Colombia. However, according to the National Hydrocarbons Agency (ANH), there is no more time to waste when it comes to the country’s reserves. One of the biggest changes by this new government has been finally launching the new Permanent Bidding Process. Originally announced in September 2015, it would be an understatement to say this has had a long gestation period. But it has finally arrived. We asked Marianna Boza and the team at Brigard Urrutia to give our readers an overview. The implementation of unconventional techniques such as fracking has been one of the main discussion topics in the oil sector this year. Orlando Cabrales Segovia, President of the Colombian Natural Gas Association (Naturgas), spoke about this issue and about the proposal to carry out pilot projects in the country. The Farc said it will go to the International Criminal Court (ICC), after President Duque objected to six articles of the Special Jurisdiction for Peace (JEP). 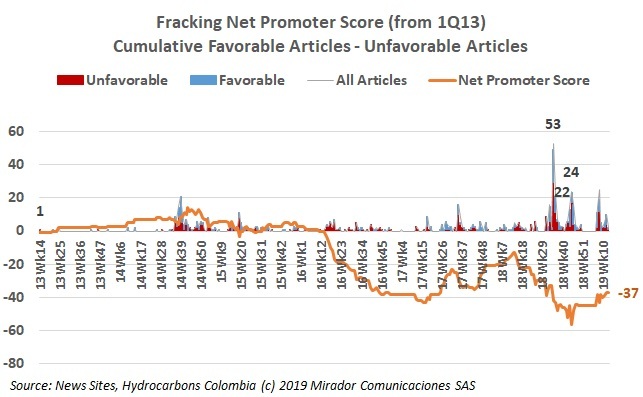 Industry Associations took the stage of the ‘Colombia Genera’ (literally: Colombia Produces) forum, to have a fact-based conversation about fracking. Ecopetrol (NYSE: EC) has several projects to develop in the country this year and pilot fracking projects are key to the firm. The NOC announced its plan on this issue. The National Federation of Fuel and Energy Distributors (Fendipetroleo) hosted a press conference. HCC attended the event.